As the weather begins to turn cooler, the leaves start changing color, and the calendar at last turns to October, thoughts start turning toward Halloween and haunted houses, trails, and carnivals begin popping up in seemingly every fairground, theme park, and corn field in the country. 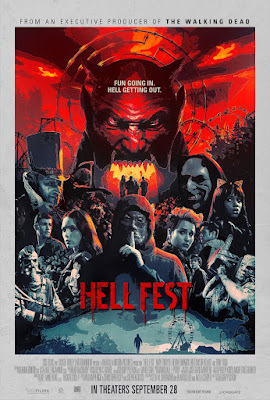 Gregory Plotkin's Hell Fest seems to live and breathe the autumn air and haunted ebullience that permeates October, coming to life amid the cheaply constructed halls and and neon lights of a sideshow haunted attraction that looks like it could have popped up in any small town in America. The film follows a group of college students into the eponymous carnival for a night of spooky fun. They are nagged by an urban legend of a girl who was murdered in a haunted house very similar to the one they're going to, her body left undetected amongst the grotesque props for three days before being discovered. Once inside the maze of cheesy scares and outrageous costumes, they find themselves stalked by a masked killer who targets obnoxious guests who just don't seem to be in the mood for a good scare, ensuring that the scares become all-too-real. When they attempt to alert the authorities no one believes them. They are, after all, in a haunted house - stalking and creepy behavior are to be expected. It isn't long before bodies start dropping right before their eyes, and they're the only ones who know that this isn't just part of the act. It's an ingenious premise, one that seems so obvious that it's surprising someone hasn't come up with it before now. As someone who has spent more than a decade designing, managing, or acting in haunted attractions, this writer was consistently impressed with how Plotkin (Paranormal Activity: The Ghost Dimension) so indelibly captures the look and feel of that world. Less impressive, however, is the script. The characters are all uniformly bland and forgettable, the drama poorly written and their personalities woefully one-dimensional. Each character has one character trait from which they never stray, making it hard to care when the knife starts slashing. Indeed, everyone in Hell Fest is little more than kill fodder for the anonymous murderer who stalks them. On the other hand, Plotkin is clearly having a blast, and that infectious sense of fun is what makes the film worth watching. It's an agreeably good-natured fright-fest that gleefully evokes the spirit of sideshow haunted houses, managing to overcome its weak script and wooden characters through its delightfully spooky desire to entertain. It even mines a few genuine scares through its suggestion that the killer could be anyone at any haunted house in the country, in a surprisingly effective homage to the ending of John Carpenter's Halloween (it even tips its hat to the great Lucio Fulci at one point), tapping into that innate “what if it’s not fake after all” fear that makes these haunts so fun Hell Fest is essentially the cinematic equivalent of an amusement park funhouse - it provides just the right amount of visual pizazz and things that jump out and yell boo. The audience is fully aware that this is no great shakes, but it's a hell of a fun ride anyway. 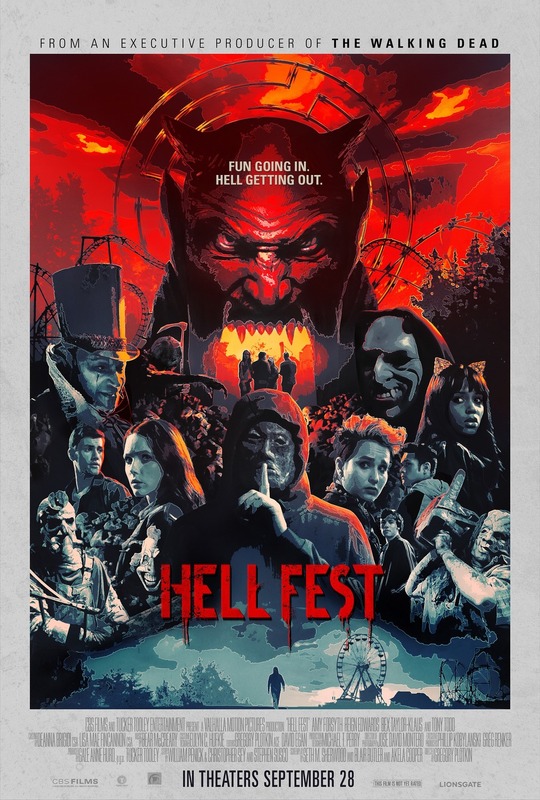 HELL FEST | Directed by Gregory Plotkin | Stars Amy Forsyth, Reign Edwards, Bex Taylor-Klaus, Christian James, Roby Attal, Matt Mercurio, Courtney Dietz | Rated R for horror violence, and language including some sexual references | Now playing in theaters nationwide.